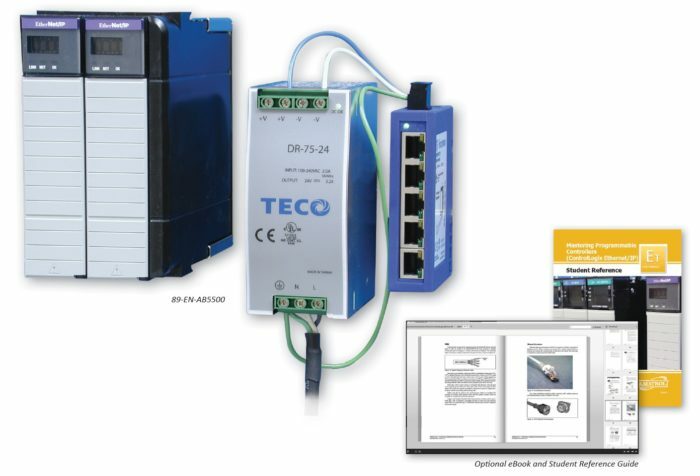 Amatrol’s PLC EtherNet Learning System (89-EN-AB5500) teaches the fundamentals and troubleshooting of industrial communications networks using EtherNet/IP. EtherNet/IP has become very popular as an industrial communications network, offering high data transfer speed, flexibility of communicating on both the Enterprise level and the Automation and Control level, and a choice of vendors when purchasing equipment. It is important for technicians to understand different types of networks and their operation to be able to install and troubleshoot not only networks, but also the interconnections to the PLCs. The main components of the 89-EN-AB5500 are two EtherNet/IP PLC modules and two EtherNet 5-port switches. Learners will use these components with additional required learning systems including the PLC Troubleshooting Learning System – AB ControlLogix (890-AB5500) to practice fundamentals such as: basic PLC operation and programming, motor control, event sequencing, I/O interfacing and testing, process control, and material transfer. Amatrol uses industrial-quality components for durability to stand up to frequent use and so that learners can get real-world experience with components that they’ll actually see in the field. how to operate, install, configure and troubleshoot EtherNet/IP networks. The 89-EN-AB5500 features two 1756-ENBT ControlLogix EtherNet/IP modules, two EtherNet 5-port switches, a cable connector set with five patch cables and a cross-over cable, two DIN rail-mounted 24-VDC power supplies and more! Specific hands-on skills that will incorporate these components include: setting the IP address of a 1756-ENBT EtherNet/IP module, converting a project using local I/O into one using Remote I/O, and transferring data between controllers using produced and consumed tags on EtherNet/IP. The 89-EN-AB5500’s curriculum begins with an introduction to the operation, installation, and configuration of industrial communication networks and moves into more advanced topics such as remote I/O, produced/consumed data and messages, and troubleshooting EtherNet/IP. Specific learning objectives include: the operation of connections in a ControlLogix Remote I/O network, four causes of faults in an EtherNet/IP network, and how to troubleshoot the MSG instruction. In addition to the included printed curriculum, Amatrol also offers this course in an online eBook format. Amatrol’s eBooks provide easy, quick navigation and searchable course content in an online, computer-based format. A sample copy of the Mastering Programmable Controllers (ControlLogix EtherNet/IP) Student Reference Guide is also included with the system for your evaluation. Sourced from the system’s curriculum, the Student Reference Guide takes the entire series’ technical content contained in the learning objectives and combines them into one perfectly-bound book. Student Reference Guides supplement this course by providing a condensed, inexpensive reference tool that learners will find invaluable once they finish their training making it the perfect course takeaway.